We saw in our tutorial about Electrical Power that AC circuits which contain resistance and capacitance or resistance and inductance, or both, also contain real power and reactive power. So in order for us to calculate the total power consumed, we need to know the phase difference between the sinusoidal waveforms of the voltage and current. In an AC circuit, the voltage and current waveforms are sinusoidal so their amplitudes are constantly changing over time. Since we know that power is voltage times the current (P = V*I), maximum power will occur when the two voltage and current waveforms are lined up with each other. That is, their peaks and zero crossover points occur at the same time. When this happens the two waveforms are said to be “in-phase”. The three main components in an AC circuit which can affect the relationship between the voltage and current waveforms, and therefore their phase difference, by defining the total impedance of the circuit are the resistor, the capacitor and the inductor. The impedance, (Z) of an AC circuit is equivalent to the resistance calculated in DC circuits, with impedance given in ohms. For AC circuits, impedance is generally defined as the ratio of the voltage and current phasor’s produced by a circuit component. Phasor’s are straight lines drawn in such a way as too represents a voltage or current amplitude by its length and its phase difference with respect to other phasor lines by its angular position relative to the other phasor’s. AC circuits contain both resistance and reactance that are combined together to give a total impedance (Z) that limits current flow around the circuit. But an AC circuits impedance is not equal to the algebraic sum of the resistive and reactive ohmic values as a pure resistance and pure reactance are 90o out-of-phase with each other. But we can use this 90o phase difference as the sides of a right angled triangle, called an impedance triangle, with the impedance being the hypotenuse as determined by Pythagoras theorem. This geometric relationship between resistance, reactance and impedance can be represented visually by the use of an impedance triangle as shown. Note that impedance, which is the vector sum of the resistance and reactance, has not only a magnitude (Z) but it also has a phase angle (θ), which represents the phase difference between the resistance and the reactance. Also note that the triangle will change shape due to variations in reactance, (X) as the frequency changes. Of course, resistance (R) will always remain constant. Real power P, also known as true or active power, performs the “real work” within an electrical circuit. Real power, measured in watts, defines the power consumed by the resistive part of a circuit. Then real power, P in an AC circuit is the same as power, P in a DC circuit. So just like DC circuits, it is always calculated as I2R, where R is the total resistive component of the circuit. As resistances do not produce any phasor difference (phase shift) between voltage and current waveforms, all the useful power is delivered directly to the resistance and converted to heat, light and work. Then the power consumed by a resistance is real power which is fundamentally the circuits average power. To find the corresponding value of the real power the rms voltage and current values are multiplied by the cosine of the phase angle, θ as shown. Where real power (P) is in watts, voltage (V) is in rms volts and current (I) is in rms amperes. Then real power is the I2R resistive element measured in watts, which is what you read on your utility energy meter and has units in Watts (W), Kilowatts (kW), and Megawatts (MW). Note that real power, P is always positive. Reactive power Q, (sometimes called wattless power) is the power consumed in an AC circuit that does not perform any useful work but has a big effect on the phase shift between the voltage and current waveforms. Reactive power is linked to the reactance produced by inductors and capacitors and counteracts the effects of real power. Reactive power does not exist in DC circuits. Unlike real power (P) which does all the work, reactive power (Q) takes power away from a circuit due to the creation and reduction of both inductive magnetic fields and capacitive electrostatic fields, thereby making it harder for the true power to supply power directly to a circuit or load. The power stored by an inductor in its magnetic field tries to control the current, while the power stored by a capacitors electrostatic field tries to control the voltage. The result is that capacitors “generate” reactive power and inductors “consume” reactive power. This means that they both consume and return power to the source so none of the real power is consumed. To find reactive power, the rms voltage and current values are multiplied by the sine of the phase angle, θ as shown. Where reactive power (Q) is in volt-amperes reactive, voltage (V) is in rms volts and current (I) is in rms amperes. Then reactive power represents the product of volts and amperes that are 90o out-of-phase with each other, but in general, there can be any phase angle, θ between the voltage and the current. Thus reactive power is the I2X reactive element that has units in volt-amperes reactive (VAr), Kilovolt-amperes reactive (kVAr), and Megavolt-amperes reactive (MVAr). We have seen above that real power is dissipated by resistance and that reactive power is supplied to a reactance. As a result of this the current and voltage waveforms are not in-phase due to the difference between a circuits resistive and reactive components. Then there is a mathematical relationship between the real power (P), and the reactive power (Q), called the complex power. The product of the rms voltage, V applied to an AC circuit and the rms current, I flowing into that circuit is called the “volt-ampere product” (VA) given the symbol S and whose magnitude is known generally as apparent power. This complex Power is not equal to the algebraic sum of the real and reactive powers added together, but is instead the vector sum of P and Q given in volt-amps (VA). It is complex power that is represented by the power triangle. The rms value of the volt-ampere product is known more commonly as the apparent power as, “apparently” this is the total power consumed by a circuit even though the real power that does the work is a lot less. 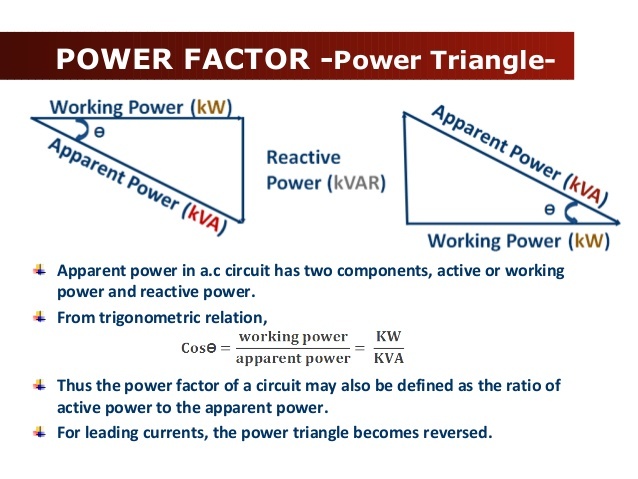 As apparent power is made up of two parts, the resistive power which is the in-phase power or real power in watts and the reactive power which is the out-of-phase power in volt-amperes, we can show the vector addition of these two power components in the form of a power triangle. A power triangle has four parts: P, Q, S and θ. The three elements which make up power in an AC circuit can be represented graphically by the three sides of a right-angled triangle, in much the same way as the previous impedance triangle. The horizontal (adjacent) side represents the circuits real power (P), the vertical (opposite) side represents the circuits reactive power (Q) and the hypotenuse represents the resulting apparent power (S), of the power triangle as shown. Cosθ = P/S = W/VA = power factor, p.f. The power factor is calculated as the ratio of the real power to the apparent power because this ratio equals cosθ. Power factor, cosθ, is an important part of an AC circuit that can also be expressed in terms of circuit impedance or circuit power. Power factor is defined as the ratio of real power (P) to apparent power (S), and is generally expressed as either a decimal value, for example 0.95, or as a percentage: 95%. That is the number of watts consumed is the same as the number of volt-amperes consumed producing a power factor of 1.0, or 100%. In this case it is referred to a unity power factor. That is the number of watts consumed is zero but there is still a voltage and current supplying the reactive load. Clearly then reducing the reactive VAr component of the power triangle will cause θ to reduce improving the power factor towards one, unity. It is also desirable to have a high power factor as this makes the most efficient use of the circuit delivering current to a load. An inductive circuit where the current “lags” the voltage (ELI) is said to have a lagging power factor, and a capacitive circuit where the current “leads” the voltage (ICE) is said to have a leading power factor. A wound coil that has an inductance of 180mH and a resistance of 35Ω is connected to a 100V 50Hz supply. Calculate: a) the impedance of the coil, b) the current, c) the power factor, and d) the apparent power consumed. Also draw the resulting power triangle for the above coil. Data given: R = 35Ω, L = 180mH, V = 100V and ƒ = 50Hz. 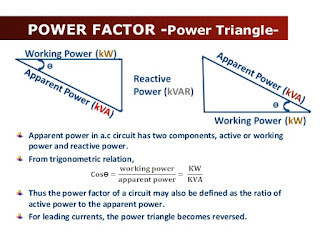 As the power triangle relationships of this simple example demonstrates, at 0.5263 or 52.63% power factor, the coil requires 150 VA of power to produce 79 Watts of useful work. In other words, at 52.63% power factor, the coil takes about 88% more current to do the same work, which is a lot of wasted current. Adding a power factor correction capacitor (for this example a 32.3uF) across the coil, in order to increase the power factor to over 0.95, or 95%, would greatly reduce the reactive power consumed by the coil as these capacitors act as reactive current generators, thus reducing the total amount of current consumed. We have seen here that the three elements of electrical power, Real Power, Reactive Power and Apparent Power in an AC circuit can be represented by the three sides of a triangle called a Power Triangle. As these three elements are represented by a “right-angled triangle”, their relationship can be defined as: S2 = P2 + Q2, where P is the real power in watts (W), Q is the reactive power in volt-amperes reactive (VAr) and S is the apparent power in volt-amperes (VA). We have also seen that in an AC circuit, the quantity cosθ is called the power factor. The power factor of an AC circuit is defined as the ratio of the real power (W) consumed by a circuit to the apparent power (VA) consumed by the same circuit. This therefore gives us: Power Factor = Real Power/Apparent Power, or pf = W/VA. Then the cosine of the resulting angle between the current and voltage is the power factor. Generally power factor is expressed as a percentage, for example 95%, but can also be expressed as a decimal value, for example 0.95. When the power factor equals 1.0 (unity) or 100%, that is when the real power consumed equals the circuits apparent power, the phase angle between the current and the voltage is 0o as: cos-1(1.0) = 0o. When the power factor equals zero (0), the phase angle between the current and the voltage will be 90o as: cos-1(0) = 90o. In this case the actual power consumed by the AC circuit is zero regardless of the circuit current. In practical AC circuits, the power factor can be anywhere between 0 and 1.0 depending on the passive components within the connected load. For an inductive-resistive load or circuit (which is most often the case) the power factor will be “lagging”. In a capacitive-resistive circuit the power factor will be “leading”. Then an AC circuit can be defined to have a unity, lagging, or leading power factor. A poor power factor with a value towards zero (0) will consume wasted power reducing the efficiency of the circuit, while a circuit or load with a power factor closer to one (1.0) or unity (100%), will be more efficient. This is because a a circuit or load with a low power factor requires more current than the same circuit or load with a power factor closer to 1.0 (unity).